The experiences of Rays prospects while on the Arizona Fall League's Peoria Javelinas. Hello Rays fans and baseball fans alike. I am out in Peoria, Arizona enjoying my experience in the Arizona Fall League. I am also really enjoying watching a lot of my friends and former teammates make a push to win the ALCS. After a tough loss last night we should bounce back with Big Game James on the hill. He loves pitching in the Trop (Tropicana Field) so i like our chances in game 6. To be honest with you I may be enjoying my time here too much. That being because it is home for me. I grew up in Peoria, and have been watching the AFL since I was a little kid. It has been really nice for my family to be able to come and watch all of my games. A nice change from the season mainly because all of our affiliates are east of the Mississippi. I am sure that the ticket office looks at the pass list everyday and is amazed at all the tickets I am leaving for friends and family. They have been great about it too, they haven’t said anything to me yet! It has been a whirlwind last couple of months for me in my career. It started when my manager called me into his office to inform me that I would be representing the Rays in the AFL, which was a huge honor. Then my teammates and I in Montgomery Alabama ( The BIscuits) were in a playoff race for all of August until being nudged out at the end by the Braves affiliate in Mississippi. Right before the last game of the season my manager (Billy Gardner) called me into his office one more time. 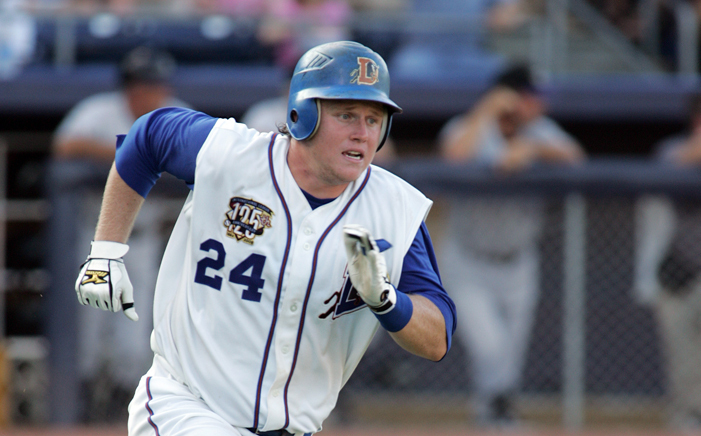 This time to tell me that I would be joining the Durham Bulls in the International League Playoffs. The whole experience would have been great had I just sat on the bench, but I got an opportunity to play and helped contribute in both the first and championship rounds of the playoffs. We lost to some of my Fall League teammates who played for the Scranton Wilkes Barre Yankees in four games but it was a lot of fun. And yes they remind me often! But I would have done the same thing to them. After I finished up in AAA I figured all I had to do was prepare myself for the AFl until I got a call from our Assistant of Player Development Chaim Bloom telling me I had been chosen for a very special award in the Rays organization the Erik Walker Award. The award signifies players from each affiliate (then whittled to one honoree) who were chosen for their community involvement and good sportsmanship throughout the season. Erik Walker was a former teammate of mine in Hudson Valley our NY Penn League affiliate. He tragically passed away in a canoeing accident in NC and the Rays created this award to remember how great a person and teammate Erik was. Being that I had played with Erik the award was a tremendous honor and I also got to spend some time with his parents who presented me the award on the the field prior to one of the Rays last home games. And now I am here at home playing for the Javelinas! Not only am i playing in Arizona but i am right in my own backyard. The Pigs are a compilation of players form the Rays, Reds, Yankees, Brewers,and Mariners. Playing in the fall league is a great piece of a minor leaguers development. The exposure as well as all of the other talent in the league is incredible. Many of the players have already played in the big leagues and are vying to become contributors for the organization. In Peoria we have a great group of guys who not mention are very talented. We also have our fair share of guys who have time in the big leagues. As a catcher in the fall league you don’t get to play quite as much as some of the other position players but I am tying to make the best of my opportunities. I have played well so far and we still have over a month to go so I hope I can continue to improve throughout the season. While I am here I am working on a few specific things in my own game. I want to improve my plate discipline as well as my situational hitting. And you can never be too good defensively. I learn new things about the game and myself everyday. If you cant learn anything when you are at the field playing or watching you must no be paying attention. I hope that I have let you know a little bit about myself, my career, and the AFL. I am so excited to be here and trying to make the best of it. Continue to look at the blogs because I am sure my teammates will be blogging soon as well. Thanks for reading and GO RAYS!!! We are true baseball fans and have enjoyed being able to watch you play and improve over the last few years. You are a great representive for the Rays and we know you will continue to be. G. G.
I settled in a shady seat behind home plate and kicked back to watch some more great AFL baseball. For some reason, your family settled in around my area to watch the Pigs play, including you. Not trying to intrude, I kept to myself but enjoyed the eavesdropping of stories and conversations. You are blessed to have such a supportive girlfriend, parents, and family! It was obvious how proud they are of your accomplishments and supportive they are of your play! I hope to continue to give the same support to my son as he grows and plays baseball. Keep up the hard work and focus….I’ll be looking for you in the Rays dugout, soon! All the best…an Arizona Baseball Supporter!